Before anything else, I look for great backgrounds to put a dog in front of. 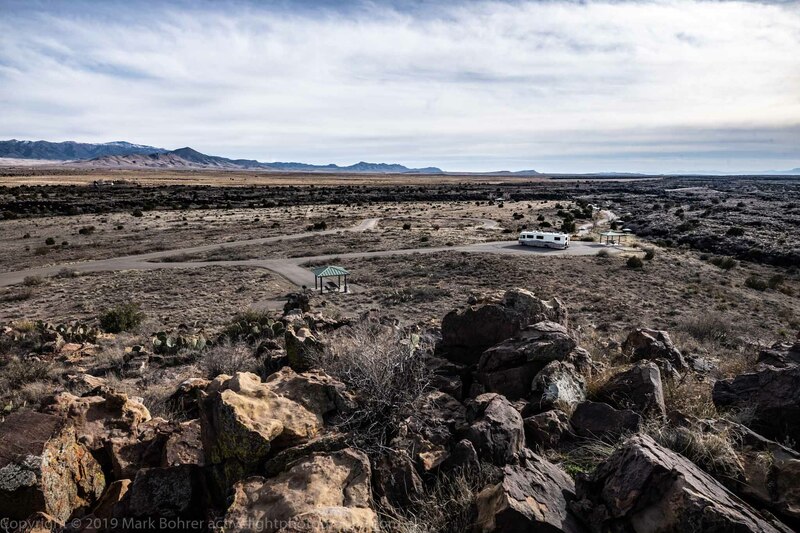 So when my wife Pat said, “How about a Carrizozo overnighter?” I was an enthusiastic “Yes!” We’d driven through Valley of Fires recreation area many times on our travels to Ruidoso or Cloudcroft, and I’d always wanted to stop there. Valley of Fires is a 5,000-year-old lava flow from the small Little Black Peak cinder cone. From above, it’s a 44-mile-long scar across the Tularosa Basin. 5,000 years is an eyeblink in geologic time – Valley of Fires is one of the youngest flows in the US. The hardened lava from eruptions at Albuquerque’s Petroglyph National Monument are around 120,000 years old. We ran a little later than I wanted with a very bland dinner at the only open restaurant in Carrizozo. 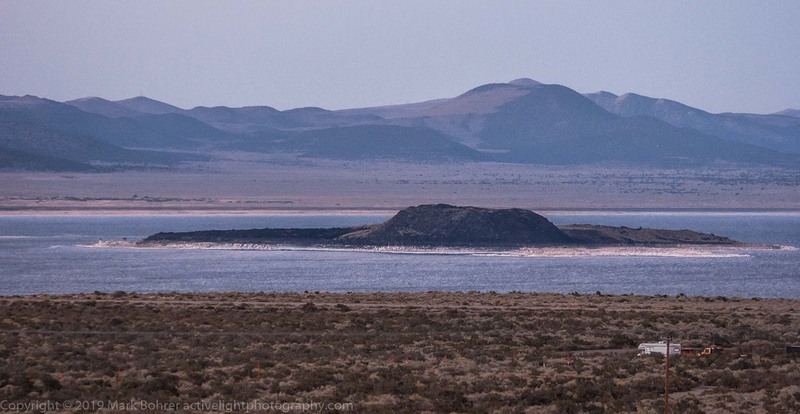 By the time we got back to our campsite overlooking the volcanic field to the west, it was a little after sunset. Brief gear interlude… I had Canon’s small 430EX III-RT speedlite to light with. I colored the speedlite with its included orange filter (aka CTO) to simulate firelight, and put a small Lumiquest Softbox III over that to soften the light. Then I screwed everything into a Manfrotto light stand. The 430EX III-RT has a built-in radio trigger, so I set it to wireless slave mode and mounted a Yongnuo YN-E3-RT transmitter in my EOS 5D mk IV’s hot shoe. The YN-E3-RT is compatible with Canon flashes, a much cheaper but less durable alternative to Canon’s own ST-E3-RT for wireless triggering. Heading into the lava field below me seemed like a bad idea in the fading light, so I just walked Buzz out to the overlook. He has an AKC Canine Good Citizen Certificate, which means that (among other things) he’ll stay in the same position in one place when I ask him to. He is a bit deaf these days, but I also trained him to respond to hand signals so I can still ask him for sits and stays. Dog trainers tell you there may come a day when your dog can’t hear, so training with visual signals is important. I plopped down the light stand with flash and softbox facing a view into the lava field below. Yes, background light was rapidly fading, but I wanted the background there just in case. I sat Buzz down facing me and started shooting. I was in a seated position at first. A higher point of view didn’t make Buzz the hero of the scene, but it did give me a look into the lava field background. 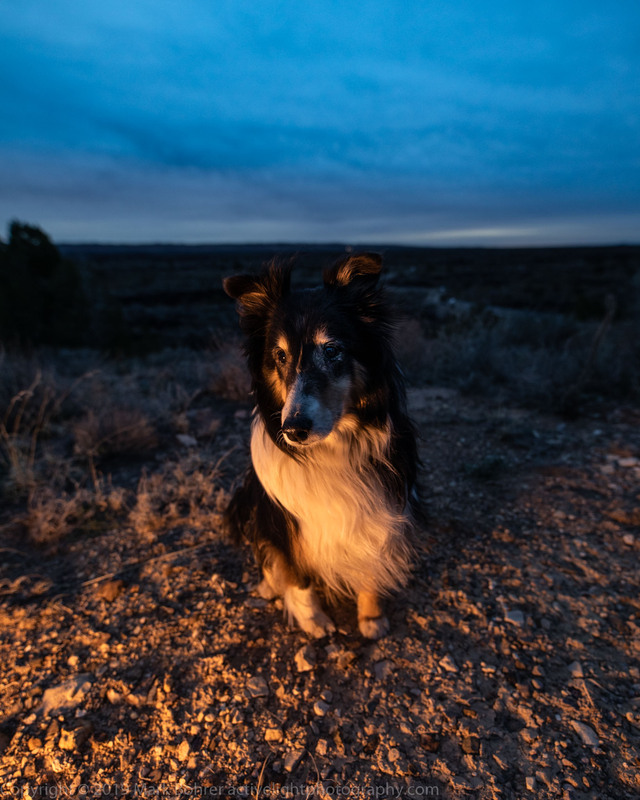 Buzz looked like he was next to his favorite campfire. This was a nice look I’d only used in ruins before and hadn’t pre-planned. For hero views, I got down on my stomach and held the camera to my eye at ground level. I placed Buzz’s head high in the frame to break up the horizontal line of the horizon. I had also wanted some wide-angle exaggeration, so I had a very wide 14mm f/1.8 lens on the camera. I was just 1-2 feet away, so perspective was extreme – we call Buzz Mr. Nose sometimes, but the close distance with a 14mm lens turned him into MR NOSE. Buzz was maybe a little bored with the whole thing and was certainly pooped after a day of travel and walking around. I couldn’t ask him what was on his mind, but he kept looking one side to the other. I just waited for expressions and head positions I liked, and captured those. It’s like photographing wildlife – you position yourself, and wait for the behavior you want. I used long shutter speeds to capture some of the background, but most of the light came from the very brief blip of flash. 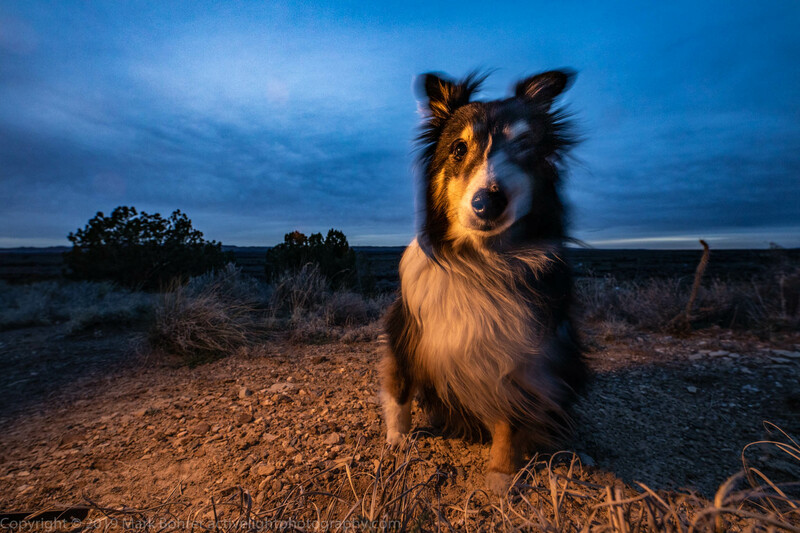 There was some blurring on the lesser-lit areas as Buzz moved his head, but sharpness around the eye facing the flash. I like this look – I’ve used it to photograph musicians performing – but it can be acquired taste, not something for every picture. After awhile, Buzz was lying down right after I sat him, so I knew it was time to quit. Background light had pretty well gone anyway. You can never really tell what you have from a 3 inch LCD on the back of a camera, and I hadn’t gotten the near-sunset views I wanted. But tomorrow was another day. It was very cloudy the next morning with rain predicted later, so I wasn’t going to get the sun as a diffraction sunstar the way I wanted it. The previous day’s shooting had taught me to find a strong foreground for Buzz to be in AND a good background. After lunch and a visit to nearby Fort Stanton, Buzz and I went down into the lava fields on Valley of Fires’ nature trail. I started at the elevated concrete of the trail, figuring this put Buzz in hero position to begin with. But the narrow concrete strip didn’t work as a foreground, so we continued on. Our next stop was at an open spot in the surprisingly-prolific desert vegetation. I again positioned Buzz in the frame with his head above the horizon. I was shooting this time with a less-wide 24mm f/1.4 for a more natural perspective but similar field of view from slightly farther away. And the cloud field gave me great background texture, with flash sufficiently powerful to make him the obvious subject. Buzz gave me some great expressions after a good night’s rest. I was done in 20 minutes this time, which let us get home before dark. 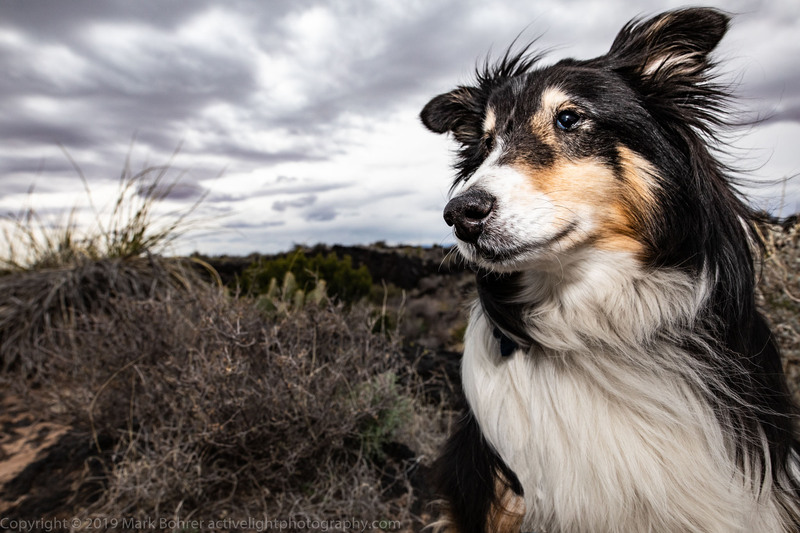 A starting point – Search for dog photography online and you’ll pull up literally hundreds of hits. But there’s one shooter’s style I really like, and that’s Boston-based Kaylee Greer. She has so much fun and the dogs look so happy in her pictures – pups seem to pop from their dramatically-colorful backgrounds. And she explains her dog-shooting techniques in several videos and interviews you can find online. My goal is always to develop a unique style. But my original starting point was Kaylee’s images. Working solo outdoors comes with a few challenges. 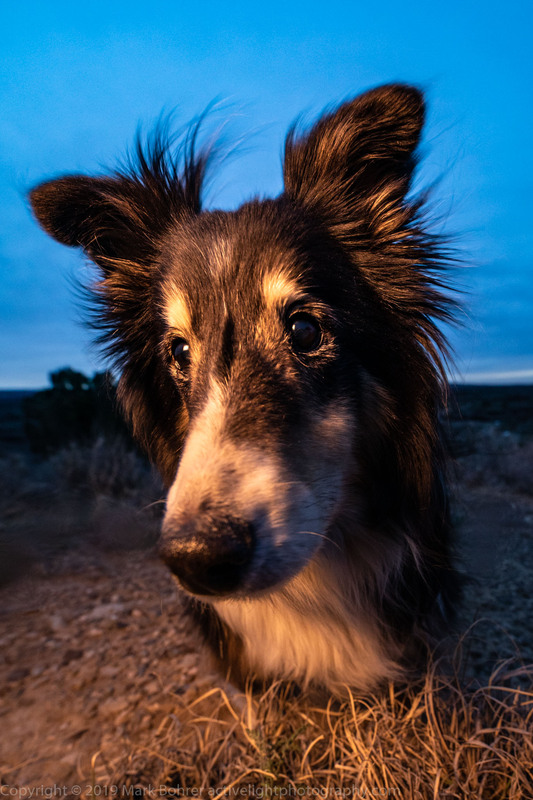 I want supplemental lighting to highlight the dog, so I use one small flash on a stand with a softbox when it makes sense. But stand and softbox mean more awkward gear to schlep around. With very wiggly, active subjects in good natural light that isn’t overly bright, I put the flash in the camera’s hotshoe with a small pocket bouncer to diffuse it, and use the natural light for fill. I know, I know, flash in the hot shoe is a no-no for its harsh shadows and deer-in-the-headlights look. But you can make it work. Making Buzz pop – I wanted a viewer’s eye to be sucked in to Buzz right away. That meant underexposing the unflashed background -1EV and overexposing flash 0.3EV. 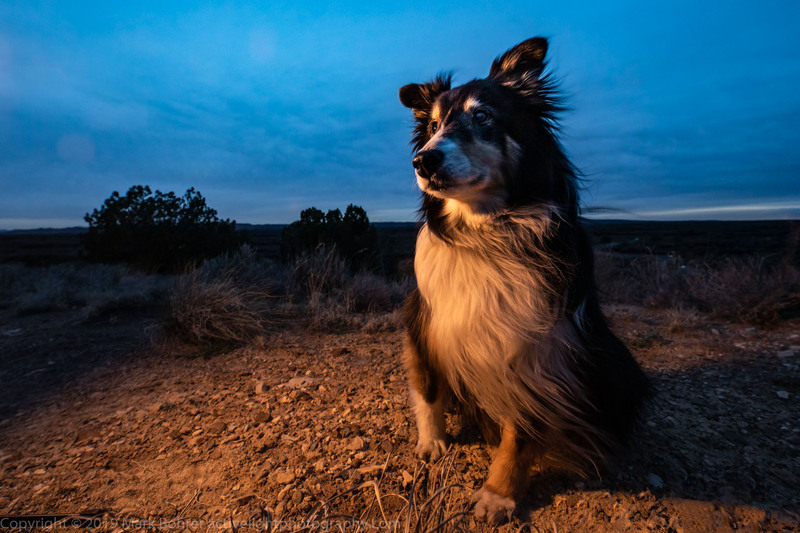 Since diffused flash was Buzz’s main light at very close distances, it made him the star of the scene against the underexposed background. I used E-TTL for flash, which freed me up to think about other things. 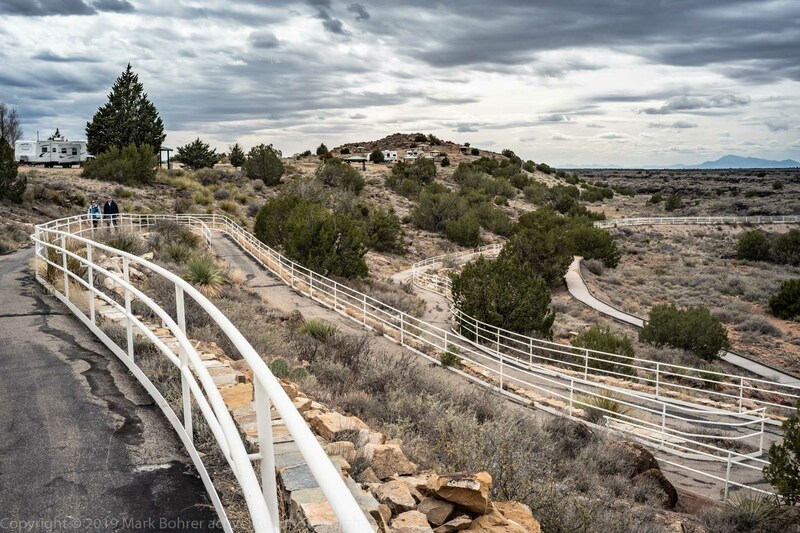 Spice up the landscape – Pretty landscapes are, well, pretty, but I want something more in them. A human or canine figure, distant picnic shelter, or some other evidence of humanity needs to be there. When I began shooting seriously in the early 1980s, I absorbed Ansel Adams’ no-people style, and kept looking for perfect landscapes to shoot. But most places have acquired what Galen Rowell used to call image maturity. You’ve seen them photographed too many times, so you almost yawn at pictures of them. Including something unusual presents those mature landscapes in a new way. 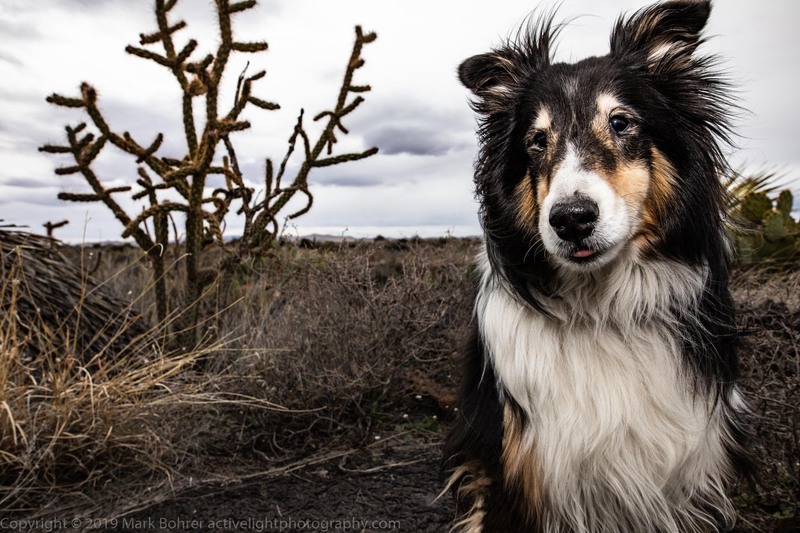 It’s more likely to hold your eye when you see a desert landscape with a cute dog. 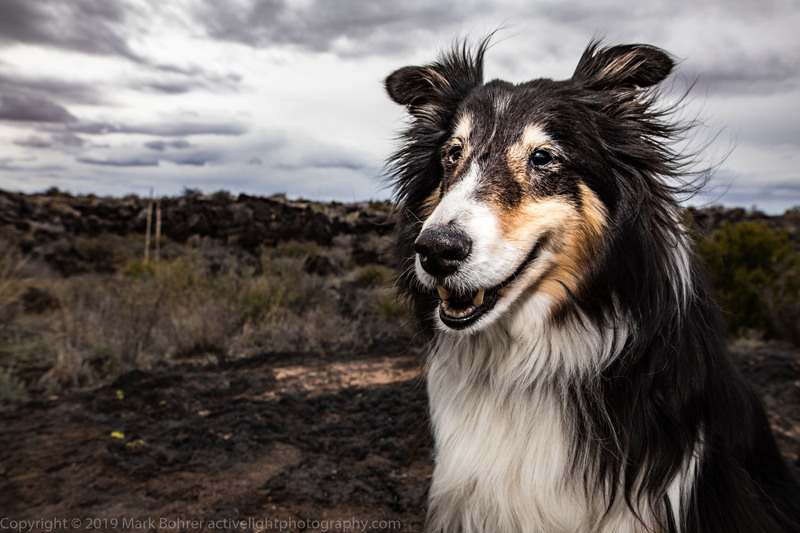 And after losing our Bernese Mountain Dog Daisy to cancer last summer, it’s become more important to preserve memories with 13-year-old Sheltie Buzz.